Invoca’s self-serve API token access is OAuth-compliant. Accessing APIs using the API token enables customers to access and in some cases modify information through a third-party app or APIs without the risk of compromising security. It also ensures that secure, sensitive customer-related information is not exposed to the third-party app. Currently, users can generate API credentials for the Transactions API and Network Integration API (the Network Integration API is available to Network users only). Enter Description and click Save. Note: It is recommended to provide a description that identifies the API type and use. 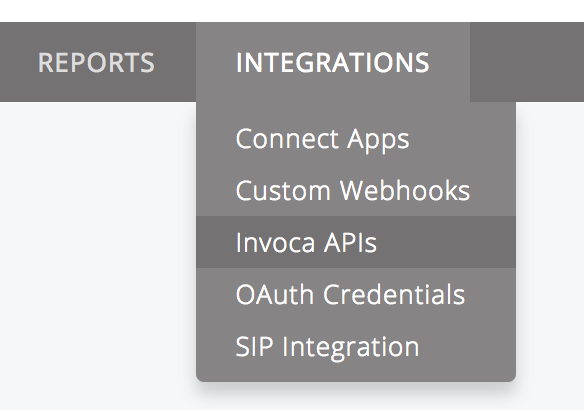 On the “Invoca API Credentials” page, click the delete icon associated to the API token to delete. Users should generate their own API tokens. Tokens should be treated like passwords and not be emailed or transmitted over other insecure mediums, nor should they be stored in a customer’s source code repository. As a network user, you should not generate a token on behalf of Advertisers or Publishers as tokens inherit the privileges of the user generating it. Invoca does not use OAuth refresh tokens.